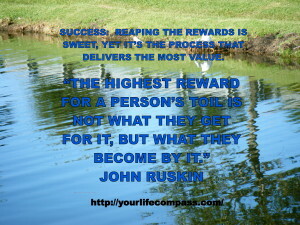 Where Will Your Life Compass Take You? Charting the course to your goals is more than just reaching the destination to your desired success. Progress and growth need to align with your core values, because values inspire and serve as signposts for what is important to you, driving you on with the meaningful purpose in achievement. Choose wisely the goals you pursue, as they end up orienting you to the person you become! Calibrate your success for stretching into and actualizing your greatest potential! ← Fitness And Self-Care ROI?